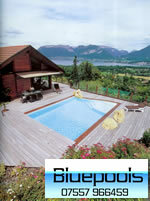 The pool pictures Below with our commments are designed to give you Ideas! 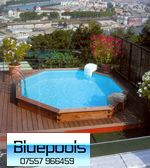 Many of these pools are of low cost and they all demonstrate that Imaginative Design of a Swimming Pool and its immediate surroundings can provide stunning pools at very Modest Cost. Please Note that the Basic Pool Costs that we provide in the following table are based on the Bluepools "Easy Way to Get a Pool Built" - If you go down the route of using a Pool Installation Contractor the Costs will be 50 to 60% higher. A Pool Installation Contractor will also have to charge VAT whereas the Easy Way will allow the avoidance of part of the VAT if your builder/plumber/electricians operate below the VAT threshold. For instance a pool that would cost about £35,000 on the Easy Way basis may require the payment of £3,000 to £5,000 in VAT on the pool equipment and building materials increasing the cost to about £40,000 at most. Generally costs in France, Spain and Italy are a bit lower than in the UK and so where the The Easy Way Cost is shown in £'s just substitute the Euro for the £. You will be in the right ball park! A stunning concrete wall with vinyl liner indoor swimming pool design. The steel beams that stabilise the high roof are painted black and the stunning depth of the Pool Hall is an illusion created by two mirrors that double the number of visual beams. Note also the very economic timber decking that matches the pine clad walls - perhaps not to everyones taste but a stunning pool with delightful natural lighting. 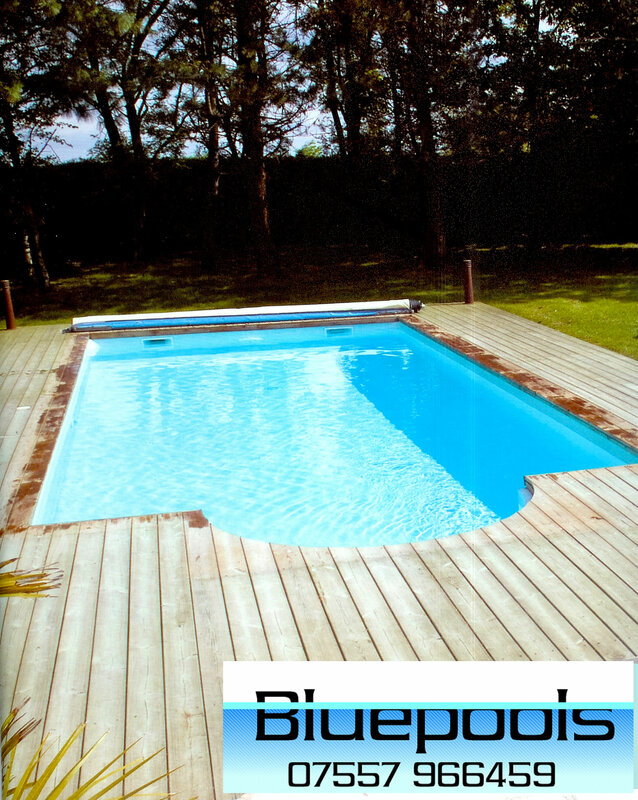 A gunite concrete swimming pool where decking has been used very cleverly - especially around the beach area. One of the disadvantages of vinyl liner pools is they do not work with a beach because the vinyl liner needs at least 200mm of water over it to hold it in place. What a difference this economic pool has made to a pretty small garden. A tiled pool woul not have worked as well and the decking just enhances the overall attractiveness of the swimming pool. This pool and pool hall is a classic example of how not to do it! The only thing that I lke about this pool is the white timber finish to the roof - but its appearance will soon be marred by condensation. 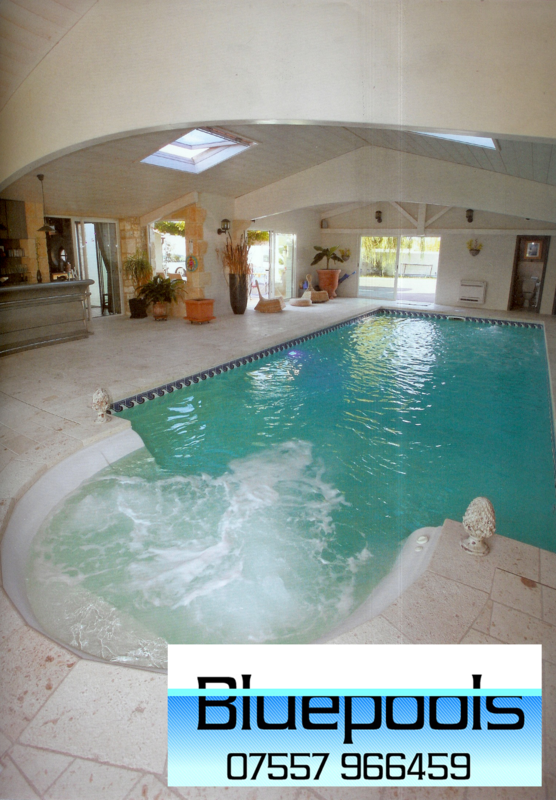 I love the classic simplicity of this pool - note how the lack of a pool plant room enhances the attractiveness. Built to a custom design by the landscape architect and includes a part in and part out of the ground design. 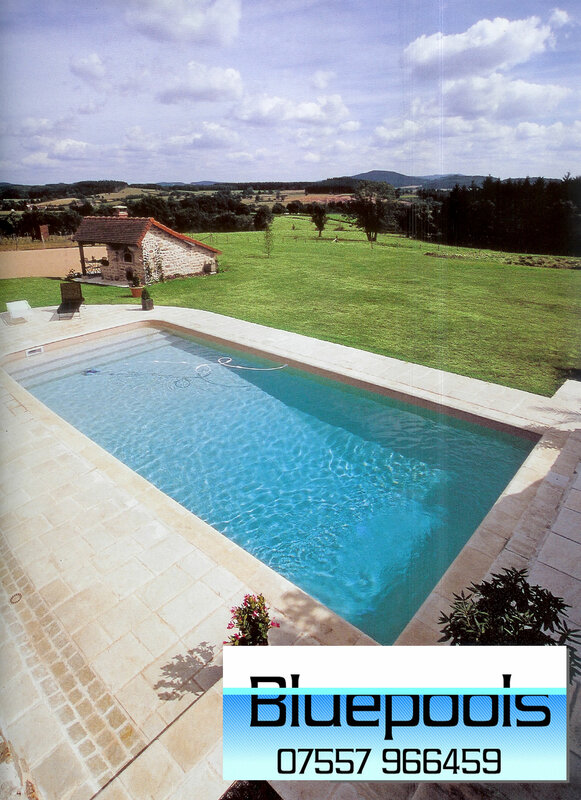 Demonstrates just how good a fibreglass pool can look. 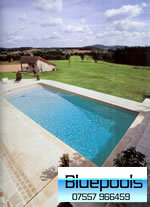 A pool that takes maximum advantage of the sloping site to provide a breathtaking bespoke design swimming pool. Another custom concrete structure pool with vinyl liner. The deck is striking especially the combination of reconstituted stone copings and softwood decking. A gunite or shotcrete swimming pool with some stunning finishes. An octagonal pine structure of simplicity that really works - but I do not like the over the wall filtration units. A masonry pool lined with fibreglass - quite unsual these days - but a very economic way to provide a large lap pool. The lack of paving means that grass will get into the pool - perhaps In-floor pool cleaning might be a sensible option in a situation like this. 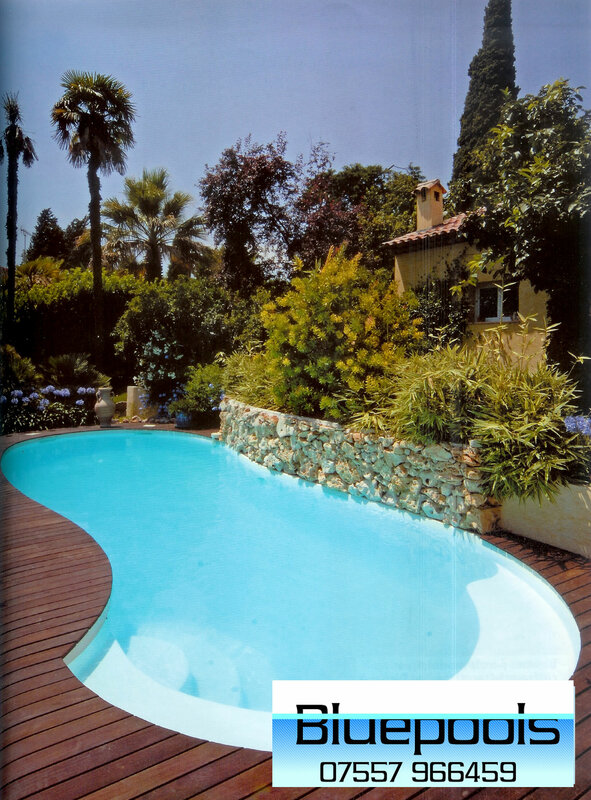 A vinyl liner pool in sable (sand) colour and a concrete structure. Another vinyl liner swimming pool in colour sky blue in reinforced concrete construction. Reinforced concrete tiled swimming pool - these are fast going out of fashion in France - but this one does look good - despite the high cost! A reinforced concrete pool with a 0.75 mm pale blue vinyl liner. The classic layout is very attractive. A very unusual custom designed pool that demonstrates that fibreglass can look very good. 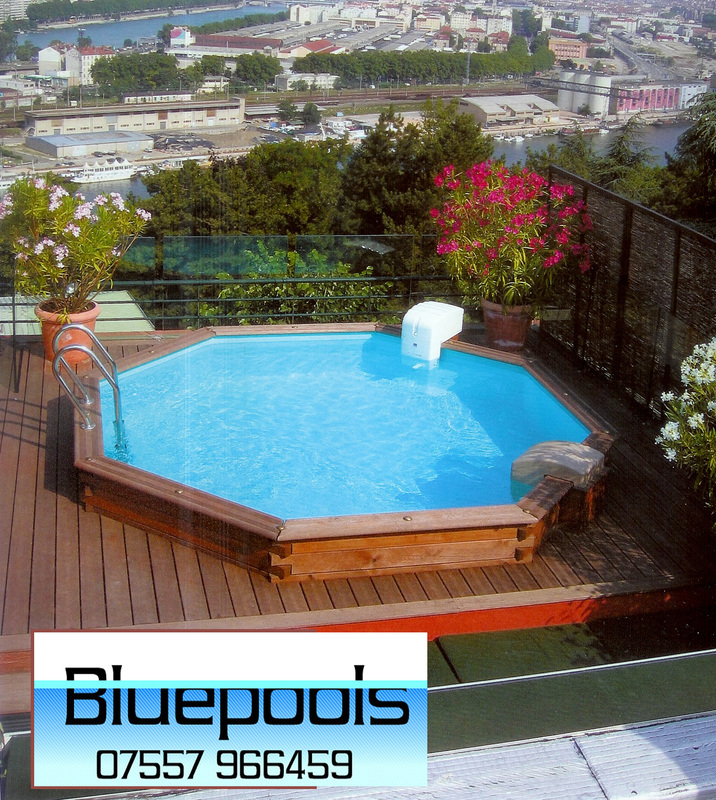 A reinforced concrete pool with a 0.75 mm clear blue vinyl liner. Another stunning custom design - on a pool site to die for!! 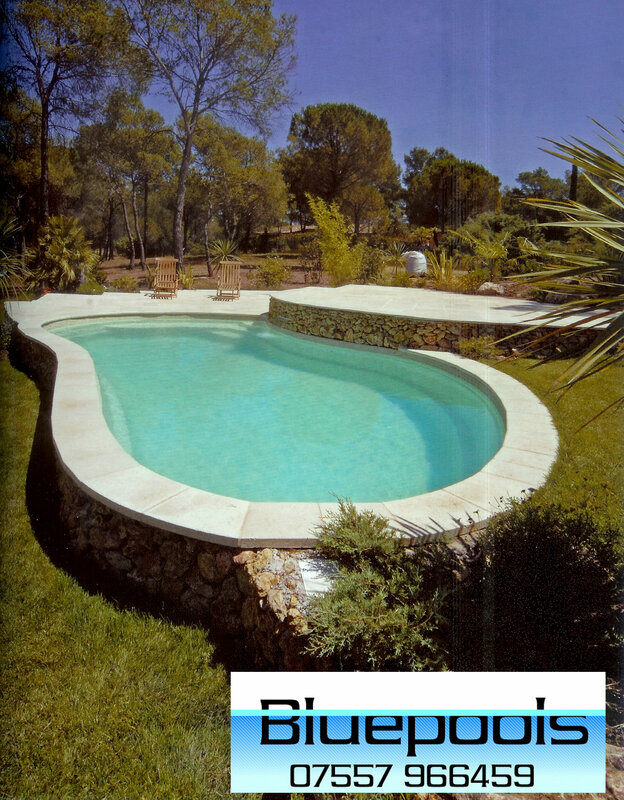 A shotcrete concrete pool with a plaster finish - a very luxurious pool - it is strange how the French love to build hideous pool plant rooms alongside gorgeous looking pools. In this instance I would have done everything but design a building like that!